The wacky diner game Overcooked is coming to Xbox One and PlayStation 4 next month. 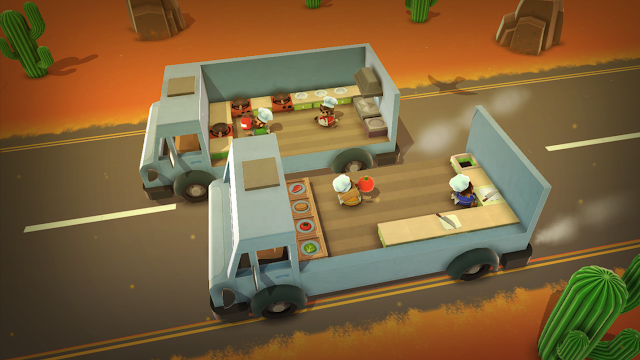 With both solo and 4-player co-op, you and your fellow chefs must prepare, cook, and serve a variety of dishes. In the campaign you’ll have to travel across space and thyme, quite literally, on your quest to become the ultimate top chef capable of saving the endangered Onion Kingdom! Take on a wide range of unusual kitchens including street festivals, pirate ships, food trucks, haunted houses, frozen realms, fiery volcanoes and outer space! You’ll have to cook a range of different dishes and work together in order to become the most effective and ultimate team. Gouda luck! · 28 standard campaign levels plus an additional introductory level and final boss to conquer! · Local co-op play for 1 to 4 players across all campaign levels! · 14 different chefs to play as! Overcooked is set to release on August 3rd for $17. PlayStation 4 owners can pre-order starting today. Xbox One owners will be able to pre-order the game starting on July 20th.